Despite all kinds of criticism of its extravagance and morality, the passion for fine cosmetics remained one of the constants of daily life throughout the Roman World. The production of glass bottles, flasks, and juglets that would be used to store or prepare cosmetic ingredients therefore was always a stable part of the glassworking industry. Though several of the most sought after ingredients for Roman cosmetics and originated in the eastern provinces, they were still expensive. 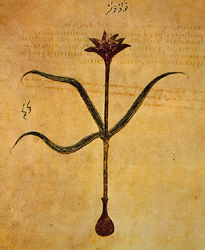 Early in the 4th century A.D., a pound of saffron—the product of some 4000 flowers of the saffron crocus—cost about 2000 denarii. For that amount you could employ a carpenter or a shepherd for about two months, or buy 180 pounds of beef in the marketplace. Bowman, A.K., 1980: “The Economy of Egypt in the Early Fourth Century,” in Imperial Revenue, Expenditure and Monetary Policy in the Fourth Century A.D., 23-40 (edit., C.E. King; Oxford: BAR Intern. 76). 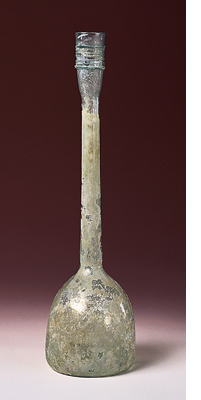 Fleming, S.J., 1996: "Late Roman Glass at the University of Pennsylvania Museum,” Expedition 39.2, 29-51. Graser, E.R., 1940: in An Economic Survey of Ancient Rome V, 305-421 (London: Oxford University Press). McMullen, R., 1987: “Tax Pressure in the Roman Empire,” Latomus XLVI.4, 737-754.